A s90 Honda, of perhaps 1960's models, very contemporarily popular (known as Honda Butir Nangka - from the jack fruit seed shape of the fuel tank.) I traded-in one like this for my scooter, in anticipation it would release my burden of the installment; admittedly it was a mistake, it viciously backfired. Continuing in the second year at UKM, staying in Second Residential College (Room C12 with mate Wan Mohamed) in Scetion 17, PJ, the FPI and Chemistry Department campus, life in 1973 was very challenging indeed. I lost many of the challenges to the nature in exchange for the stresses I could not stand alone. It was not that I lost my father's moral support since last year February, but his passing away had robbed my feeling of being on a way to somewhere; it instead ghosted into a traumatic selflessness and the feeling that my journey was being stopped by something. My younger brother Num in Politeknik Ungku Omar, Ipoh, unvisited since his registration day Nov 26 Sun last year, and my younger sisters Mek, Rubaihah and Ani, and the baby, my youngest brother Jo, at home with my mother were in needs indeed in trying to feed themselves. Many times they wrote to me for some subsistance, and I replied with a fraction of any mean at that time. In Feb end I survived with 3RM (actually rescued by Abdullah Yusof and Harun before I was replenished by the pay from Lim tutorial fees). It came to a sense to me that the scooter was a burden with its installment and the fuel and the raod tax, but I badly needed one alike to move around to do many things that my other friends did not need to do, that on Jan 9 Tuesday I took it to Guan Thye Motor, Bangsar, to forfeit my installment balance with a very old Honda s90, BN 5243. It broke down the day I took it to my place, and it kept on breaking down day by day, part by part; it eventually costed more than the previous scooter's installment, and it gave me more trouble than before. It was not actually a good idea at all; I neglected it in front of the FPI Office lobby for many months and ended its life (with head lamp chopped off possibly by a thief) with a 50 ringgit at Soh Motor, Section 16 on July 16 Monday. I was really in a very bad shape. Now I lost the final substance of the very reason I chose not to stay in the residential college when I first checked in UKM in May 1971. I never tasted before the effect of neglecting the lecture so much (in my 2nd year final exam that began on Jan 29 Mon), until its bitter extract got into my heart when I failed severely in Math, the subjects I was very keen and always good at. When I got into the third year in late May, I had to repeat one Statistic and one Numerical Analysis papers. Luckily then UKM has changed its system into quarter system which meant that we had to repeat only the paper that we had failed, not the whole year. Otherwise I would surely be in the second year again this year. Before I moved into the college last November, I slept mostly in the lecture rooms in UKM Pantai Baru, in the Gymnasium and even squatted in friends room in the college, until it came to my mind that I must organise myself if I wanted to go through, and no matter what had happened life must go on. I faintly knew him, Shafie Abu Bakar, in 1966 when he was in Sultan Zainal Abidin School, Batu Buruk. He went to UKM too, my immediate senior. I believed he tracked me well, that in 1972 and 1973 he asked me to write in the College's megazines he chief-editored: SEMESTA and JITU. He joined the UKM staff rank too and lecturing in Language Institute of the FSKK. When he retired in 1998 he joined politic and in 1999 Dr Shafie Abu Bakar was elected ADUN Kajang. His wife was my daughters' ustazah in SRK BBBangi, Ustazah Mukminah, until she retired (early). She was a daughter of Ustaz Yusof of Padang Midin I heard about in 1965 and 1966. My wife and I knew each other rather well although we rarely visited each other. 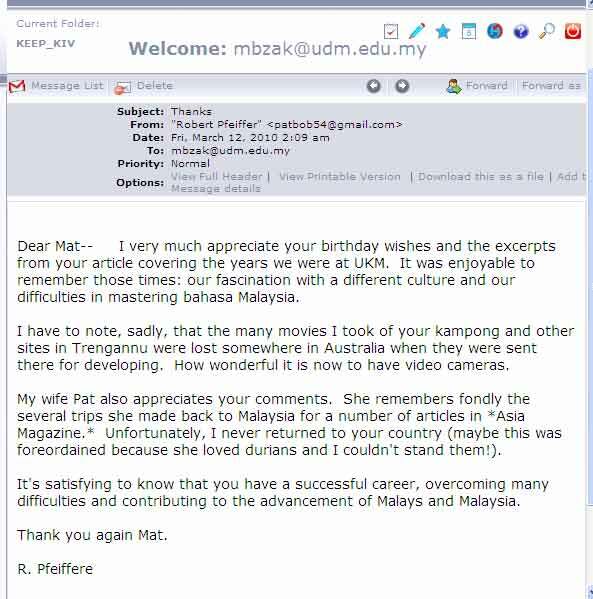 Our acquaintances were more co-bonded by the people he and I knew in Terengganu. Life in the Second College was very merry actually; the foods were good; more non-FPI students of all years resided in the college because more FPI student chose to stay outside. Perhaps the life began with the Eid Azha on Jan 14 Sun. Chemistry Department, with its department and head department offices were firmly in this campus, and some Geology labs were moved here too. I tried to make up what I thought was a campus life; plenty of energy releasing mechanism in the evening, either badmintom games in the Dewam Al Malik Faisal, or a mere stupid running around the football pitch. Being 'new' and 'admired' I had no problem in assimilating with the college boarders even though I was actually a 'kaki bangku'. I really got very close to my room mate, Wan Mohamed, the person whose colour I admired since 1965, and many other of their colleagues - my immediate seniors, especially Idris Mamat, another state mate I met in SAS in 1967. We went out together on many occasions and as he himself was an active committee member in the UKM students society (PMUKM), many times he asked my favour to help him, especially on transportation matters. Wan Shamsudin Mamat was another batch-mate who had never unreluctant to get me accompanied on what ever matter. He was an FPI student and always appeared never unpleased with me around him; and thus his friends of mostly from the same faculty. Wan Shamsudin was also a great potential in future since, like Wan Mohamed, he was an active hand in the society, especially Terengganu Students Society (PERMATA), and an 'inborn leader'. He did not hesitate in dragging me into the committee, since last year. Even though all these frolics were in the surrounding of my course mates, many were SAS-ians, I was more pleased by the FPI batch mates and the seniors. And I never missed the tutorial timetable for the Lim Bok Sin's children in Sungai Way, until I decided to stop on Mar 5 because of transportation difficulty. But perhaps the bigger stopping force was that in Mar, I had another bigger source of income. The tutors; back-row: Husin Long (Chemistry), Azahari Salleh (Chemistry), Adnan Khalid (Physics), Mat Zakaria (Physics). Front-row: Noraini Dan (biology) and Tajul Ariffin (Biology) - Mar 8 Thu. The third quarter break, used to be so-called long vacation, began in mid Feb after a week of examination. There was still remnants of my intrinsical math and physics from last year. 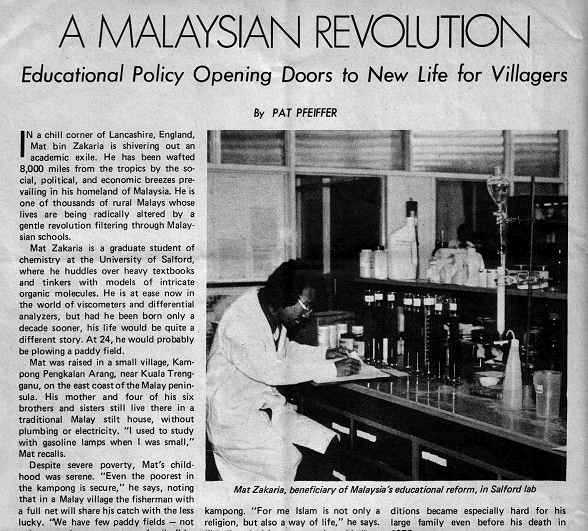 I was given (Jan 18 Thu) to tutor Kelas Asuhan MARA, the "temporary lower six", an ad hoc programme organised by MARA, whose students (about 300) were country-wide selected post-1972 SPM-mers, headed by En Mokhtar Bidin, a math lecturer. I would teach physics. They were in eight classes, four of them: gamma-1, gamma-2, delta-1 and delta-2 were stationed in the second campus. The other four: alpha-1, alpha-2, beta-1 and beta-2 were stationed in Pantai campus. It was my idea to name the class by alpha, beta, gamma and delta. I thus had a place to stay (in the college) and had the things to do for the vacation. Practically, they attended classes of physics, chemistry, biology and math in the morning (as though in the sixth form - in the lecture hall in FPI for the gamma - delta classes); practicals in the afternoon in Pantai Bharu. An indoor activity of a quizz among the classes, Mar 3 Sat. I MC-ed the occasion in the ODT Pantai Bharu, Adnan Khalid the referee, plus a female student the time keeper; Prof Ghazali the dean gave way the prizes and officiated the closing ceremony; and at time they were organised into outing to various places: to SAS, Cheras for a friendly games Mar 10 Sat (it was today that I saw my name was carved on the plaque as the 8th HB), around KL Mar 18 Sun (national zoological park, Batu Cave, lunch in Templer Park, Tugu Negara, Subang Airport). Farewell dinner was held (for the gamma - delta) in the FPI dining hall. Students organised some 'student-brand' activities. One was about 'poison box'; the one who hold the box when the music stops is 'poisoned' with a question, failing to answer it made him to do some act as determined by the letter in the box which was picked at random. It came to my turn, and understandably the music was deliberately stopped when I hold the box. The question was asked by the MC, "An inspector was investigating a hit-and-run accident, the victim of which, an Indian, narrated the lorry plate number to the inspector: 'lapan tadak sampai, satu tiga dekat-dekat, dua tadak, tiga tadak'; what was the plate number? I could not answer (SB2030), and the punishment for that was eating a banana, to be fed by a female student. I 'endured' the punishment. The night was the students night. Their SPM results were out on Mar 20, but they stayed to finish the course to Apr 8. During this long break, of what was then the 4th quarter, some lecturers offered some papers to those who did not want to waste the long vacation. I signed up for two papers, and while tutoring the Kelas Asuhan MARA, I had my own lectures to attend. The experience was a lot of fun, and this was my first encounter with the teaching profession; it was actually like an 'industrial training' for my career to come. In the meantime we had to sort of choose the department we were going to major in. My lecturer, notably Prof Woloyo asked me to do Physics because my grade in Physics was rather good. But my heart sort of attracted to the smart white Lab Coat of the Chemistry lecturer, the grades of which were not as good as that of Physics. For this reason also I was offered as a temporary tutor in Physics, Jan to Apr to MARA's "Kelas Asuhan", for potential post-1972-SPM-mers before they eventually go according to their final SPM results. Finally I decided, I wanted to become a Chemist. Fun in the college; L to R: Khalid Abdullah, Mat Zakaria, Abdul Rahim Shamsuddin, Idris Mamat. L to R: Mat Zakaria, Ibrahim Baba, Md Wahid Sansudin, Md Sum Hj Idris, Md Nordin Lajis, Ahmad Salleh. L to R: Ibrahim Abu Talib, anon, Fadil Othman, and Mat Zakaria. I was thinking of staying on throughout the long vac in the campus. So when all the students in Kelas Asuhan Mara had gone, and the papers I signed up had been examed, I got the research assistant job for Dr Noramly, the head of Chemistry Dept. He was doing something on hormone (biochemistry) in tortoise, in partnership with Dr Gary Waegen (a biology Peace Corps lecturer). However after the tortoise was purchased in Jalan Petaling, its muddy smell turned on my feeling of missing my family very much: my brothers and my sisters, the kampong mates and the muds and the river at home. I quit the research assistant job, bought a Mara Express ticket on the same day and I went home to finish off the rest of my vacation. I spent a full final vacation fron Apr 22 at home with my family for about a month before my new 3rd year began in May 21. It was a really home vacation. I made up almost all that I lost during the past few years: with my folk mates, relatives close and distant (getting to know my father's relative around Bukit Tunggal (- that of CheGu Mat, CheGu Yusof, and CheGu Harun's families), taking my mother for a trip to Dungun (by 'chartered'-taxi, to see my first nephew, Mohd Alauddin - of my elder brother who got married just before my father passed away last year -), frolicking around Batu 6 - Kedai Abang Wi, around the mosque, 'funning' in the folks badminton court, folks festivals in Pesta Ria (Banggol Tuan Muda - May 9 Wed met Ahmad Mokhtar, my primary school classmate), beach festival (Tg Gelam and simultaneously in Batu Buruk - the week May 12), several weddings (one of my causin Mohd, AyahEndut's eldest son - May 17 Thu, and even helping Hamzah Ngah to establish an SRP free tuition class (unsuccessful: Hamzah told me permission -by whom? - was not granted) in Tok Jiring. All the while, I was back to the old days: on the bicycle to its last day (it was stolen on the night of Apr 23 Mon - and was never found - even after a thorough search with Pak Omar on Hamzah's Suzuki around Seberang Takir, Bukit Tunggal, Mengabang Telipot, Batu Rakit, and Maras), except when around Hamzah who owned a scrambling Suzuki; it was not possible to have my Honda at home as the Vespa was. It was a funfull month. New session began on May 28 Mon. I was well into the 3rd year and I was rather convinced my self that I was right to become a chemist. We were told to come early, for the pre-week from May 21 Mon, it was a study tour to Ipoh for the 3rd and 4th year chemistry students: Geological Survey Malaysia, Tasek Cement, Malaysian Chemical Industries, (a night in New Hong Kong Hotel), Veterinary Dept, and Mining Dept. The trip was a miniature. Last session, at about the same time, the 3rd year students were taken to Bandung, Indonesia, for a study tour to the atomic energy facilities. Another trip was on Jul 22 Sun to Penang: (a night in Peking Hotel, an eating spree in Padang Kota - wooden-hard fried crabs), Eastern Trading Co (tin smelting), Malayawata (steel making); a daily trip to Dunlop Industries, PJ on Oct 16 Tue. (The final trip in the series was in 1974 - to Guiness in Sg Way, Mar 21 Thu; and Chemistry Department Malaysia, PJ, Mar 23 Sat). Inevitably I was with a more confidence feeling of a senior student; resulted from my involvement with several PMUKM activities since the last session, especially the GEMASISWA, I was not a stranger in the PMUKM office in the Pantai College (amids almost all non-science students), although I stayed in Section 17 College; I even made used of the office facilities to furnish my tasks like typing manuscripts. And more especially in the Chemistry Dept with the events that my seniors were beginning to be absorbed by the Dept as tutors for further study to qualify for the permanent academic staff; the first three were Wan Mohamed, Zuriati, and Othman Omar (biology) whom we farewelled on May 24 Thu for their departure to Mahidol University, Bangkok on Jun 1 Fri.
With Wan Mohamed left, my new room mate was Azahari Salleh, my coursemate from May 27 Sun. It appeared that Azahari had not only shared the room with me, but also I shared his Honda; and 'owned' several times whenever he went home to Melaka for the week ends or so. Perhap I had annoyed him very much by borrowing his bike too many times for my personal leisure uses. And carrying around the chemistry courses, in between the lectures in Pantai Baru campus in the morning and the practicals in Section 17 campus in the afternoon, and again tutorials at nights in Pantai Baru campus were other course-mates: Fadil Othman, Mat Zuber Ramli, Hamzah Mohamad, Mohd Zahari Bakar, Hamdan Musa, Ibrahim Baba, Md Wahid Sansudin, Md Sum Hj Idris, Md Nordin Lajis, Ahmad Salleh, Md Soot Ahmad, Md Pauzi Abdullah, Ramli Hitam, Satapah Ahmad, Alyas Yusof, Atan Md Sharif, Rahmalan Ahmad, etc. Medan Selera in Section 14 was one of our regularly visited night spot for supper, satay and grilled chicken were the favourite dishes. And admittedly during the second half of the year, I frequently visited the cinemas around PJ: Ruby, State and Paramount, for various films. Satapah and Azahari were my constant company, even with Hamdan, Wan Shamsudin, Rauf, Othman Omar, Zahari Bakar, and Alias Yusof. Sometimes swayed to KL: Golden City (Ipoh Rd), Lido (Bangsar), Odeon (JTAR) and Colleseum, Faderal (Jln Raja Laut), Cathay (BB Rd), and Rex (Foch Ave). Perhaps I watched too many films in cinemas this year - Secret of the Bath (Ruby), Bed Variation (Federal), Europe Operation Striptease (Rex), A Promise of a Bed (Odeon Ipoh), The Step Mother (Ruby), Every Night of the Week (Odeon 2X), Au Pair Girls (State), Wang Yu (Ruby), Love on the Horse (Ruby), Fanny Hills Meet (Rubys), The Roommates (Paramount), Call Girls (Ruby), Violent City (Paramount), Dan Bunga2 Berguguran (Pawagam PR), Drifter (paramount), Death Blow (Golden City), Big Hunt (Paramounts), Hate Mare Sate (State), I Came Africa (Paramount), The Honest West (ODT-UKM), Fight for Duty (Ruby), Butterflies are Free (Cathay), Mad, Mad, Mad, Mad ... World (Federal), Duel (Paramount), The Gathering of Heroes (Rubys), Crocodiles Safari (Paramount), Joe Kid (Paramounts), Pengantin Remaja (ExTeats-MU), Los Amego (Odeon), V is Our Sign (State), The Big Fellow (Lido), The Women in Blue (ExTeat-MU), Boots Hill (Paramount), Deliquent (Rubys), Berakhirnya Sebuah Impian (Pawagam PRs), Bottoms Up (Paramounts), The Adventure of Tom Sawyer (Rex), Shaft in Africa (Cathay). The invisible shadow was that I was unsuccessfully attempting to rebridge the 1970 two broken dots. My brother Num and several friends had their industrial trining in Shah Alam, I visited him twice (on Aug 12 Sun and on Dec 10 Mon) and he came over to my place once on Nov 4 Sun over the six months periods. SAS-an 70 non-UKM ebb-ed although nature made us bumped each other infrequently: Omar (Jan 18 Thu when my bike was on strike, he loaned his seeing I was pushing mine around 1st College MU; Nov 15 Thu - in a forum at UKM), Sulaiman and Jamalluddin (and their pair each, on the Convocation day Jun 24 Sun), Nor Muhamad Mahadi (on leave from Australian study - with Zahari, we had a quiet lunch in Ginzabo, Lake Garden, Dec 18 Tue); Abdullah CheDin of Class of 66 in Railway Station, Apr 20, returning to his College training. PMSUKM putting up their shares, Zahari was holding the ringhat end of the banner. Enjoying the PESTA RIA of the 1st UKM Degree Conferement festivals, Jun 23-25, 1973. UKM had its first degree conferement in Dewan Bankuasi, Parliament Building on June 23 Sat. The first batch (including my former room mate Wan Mohamed, in absentia) received their degrees (general), while continuing their study in the honours year (3+1 years). But the accompanying Pesta Ria, on the field of the Pantai Baru campus, the following Sun to Tue gave me a real unstressing periods, and especially the many weeks of prepartion before that, as early as in Mar; full acceleration after the session beginning in late May. I really enjoyed joining the folks of the Persatuan Mahasiswa Sains UKM - I was in the committee, both the society and the Pesta Ria ad hoc committee - we were given several booths to run, and we ran it with full trottle. Every one was very excited with the first ever new event (to be anually) for the university. Each PMUKM's affiliate society were given the free hand to run whatever stall we would like to, and made some income for the society's fund, and we managed our own accounts from the beginning to the end of the festivals. Alas, in the end, it was just another fun-fair just like anyone in the entertaiment centres around Kuala Lumpur. It was regretted that Engineering faculty had to wait for another fifteen years to be formed in order to show to the public their creativities in such festival to be different from the entertainment centres fun-fairs. Nevertheless, the occasion was really the students' days and we fully enjoyed it with full participation. There was a part time lecturer, En Mohd Mansor Hj Salleh from UM who was teaching us Mineral Science. He noticed my writings in newspapers and megazines. In fact I like writing since the school days. The first close encounter was on Apr 01 Sun night in the ODT after his talk about ANGKASA (Angkatan Kajian Sains) in which he intended one day to take me to Radio Malaysia (RTM), Rangkaian Nasional in Angkasa Puri to be introduced to the Producer of the weekly programme "Sains Dan Orang Ramai", En Abdullah Hj Hakim. There and then I got the part time job of writing the scripts and presenting in the programme. En Mansor even loaned me his typewriter to facilitate me preparing the manuscript. The first recording (with him) was on April 11 Wed morning. In the producers room, I also met Zulkurnain Hassan, whose voice, like of Abdullah Hj Hakim, was on the radio all the time: news and sports etc. The first broadcast was on Sat afternoon 2pm, Apr 19: amazing, my voice was on the air throughout Malaysia for the first time; and it would be on most Sat afternoon. I like the programme very much, and it was a good source of income too. Normally I would prepare four scripts and went for recording in one session, for four weeks of broadcastings. I continued the job untill end of 1974, when I left for oversea, and even after the producer changed to Shaari Awang, and then Wan Hanisah Omar; and a few other years when I returned from the study leave in 1976 to 1979. A new faculty, Medical Faculty (the fourth in UKM) began this session in May, but their first year (and going to be second year) were in Pantai Baru campus to study the science papers in the science faculty. They were scheduled to go to GHKL only in the 4th year when they qualify the three years Medical Science courses and begin the Clinical courses. With the strength I had regained, I had no problem in getting myself enrolled by Prof Ahmad Amiruddin (the Head of Chemistry Department) to be a tutor for the first year medical students from Jul 11 Wed. The tutorial class was once an hour-week for a group of about 25. This was my second contact with my future career. First Quarter exam began on Aug 6 Mon, and the exam was very important to me since I carried some of the papers from last year: I price I would pay for letting loose some of my precious time. When the break began Aug 14 Mon I rode on Geology group trip to Terengganu, obviously to go home, plus another free ride on PMSUKM ticket to give talk on pre-science (precursor to UKM Matriculation) to school pupil; it was in my alma mater, SMK Padang Midin, on Aug 19 Sun with Abdul Rahman and Kaida (both were my juniors) - the same talk I gave in SMK Kolam Air on Jul 15 Sun, with Sukiman. The break was short. The 2nd Q began on Aug 27 Mon; as I wished for, the first Q results that was announced a week later, Sep 1 Sat (after returning from Sg Merab for the wedding of Norsiah, En Ahmad Keromo's daughter, the adopted father in the Working Camp last year), confirmed that I had made up what I had lost. Ramadan clocked in on Sep 28 Fri, and for the whole month, life was an ordinary college routine. I had several hostel-Ramadan in SAS before, in fact they were right during my SPM and STP. I missed many lectures in the early morning; but I never missed the tutorial class for the first year and the SDOR recording in Wisma Radio, Angkasa Puri, for the obvious reason. "Prep class" was very merry in the foyer of the lecture teatre of the Second Campus. The Eid was on Oct 27 Sat, but this was the first time I missed the Eid with my family; it was only three days holidays and the examination was due from Nov 5 Mon. I decided to miss the Eid with my family and stayed, but with the most memorable break as during the Eid days, although many boarders chose to go home, for those who were left it was an open day for the College boarders, just like the convocation days in late Jun. The memorabilia was of the trans-category of the prevailing concurrent Yom Kippur War, Oct 1973, in the Middle East. In fact I stayed on during the 2Q break week, to start the 3Q on Nov 26 Mon. About the same time in 2013 Sep, that is forty years later. Then the street was not so brightly lit-ed. Dewan Al-Malik Faisal was not even visible. The needle-leave trees were still short, we could get hidden by sitting below it. And we were under it almost every night, unstressing after a few hrs at the lobby with lesson revision, or tutorials. It was an anecdote. Left Picture: The all future-chemist with PC Dr Robert Pfeiffer. Squatting L to R: Md Som, Dr Pfiffer, and Atan Sharif. Standing L to R: Hamdan Musa, Azahari Salleh, Mat Zakaria, Alias Yusof (slightly bending), and Ibrahim Baba. Right Picture: Facing camera, L to R: Mat Zakaria, Dr Pfeiffer, Md Som, and Md Sefai, the only non future-chemist (geologist) in the group. End of the year: Dr Robert Pfeiffer, an American PC invited us for his open house in PJ new town (11, 7/6) on the second last day of the year. There were about 8 PCs checked-in UKM in 1972. Dr Pfeiffer (from Los Gatos, California) taught us Chemical Syntheses and Phytochemistry. He left UKM sometimes in mid 1974. Dr Pfeiffer's wife was Pat. In Jul 1974, she told me that she was going to see my home in Terengganu, and they did go (in my absence) and videoed my home and my family members. In 1975 when I was in Salford, UK, she contacted me to have my say on an article she was going to write for the Asia Megazine, published in Hong Kong, then distributed free with The Sunday Times in Malaysia. The article was published in June 1975. The other chemist was Dr Gary Kuehnlenz (from Cincinati, Ohio) who taught us Symmetry in Molecules (a high level theoretical chemistry course). 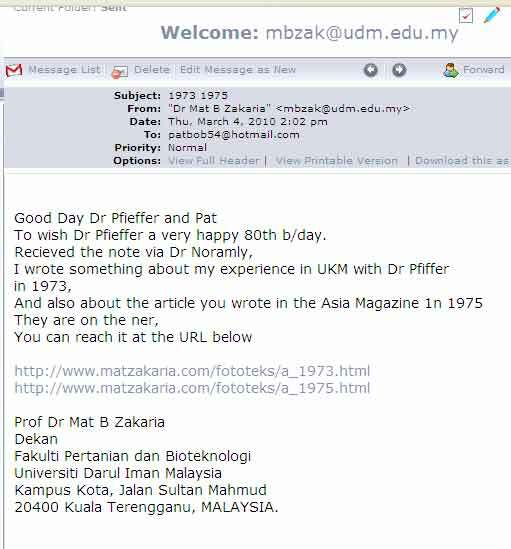 Dr Kuehnlenz left UKM in March, 1976, returning to the USA, taking along his bride, Ms. Sharifah binte Abdul Rahman, a University Administrative Assistant. The rest of the PC were biologists (one was Gery Waegen) and mathematicians. Dec 31 Mon, I got up at three in the morning. There were no lectures in the campus because PMUKM organised a demonstration in KL to oppose the appointment of our new VC, En Abdullah Ayub, a PTD. I did not participate, instead as the noon passed, I did some project practical, then dashed to Cathay to watch Shaft in Africa. By about the year ended, I finished typing three scripts to be recorded for the radio "Sains Dan Orang Ramai".